Following our very successful licensing involvement with Glasgow 2014, this was our second Commonwealth Games and we had just as much fun! We are particularly proud to be able to say we were the only UK merchandise specialist to be invited to work with Gold Coast. 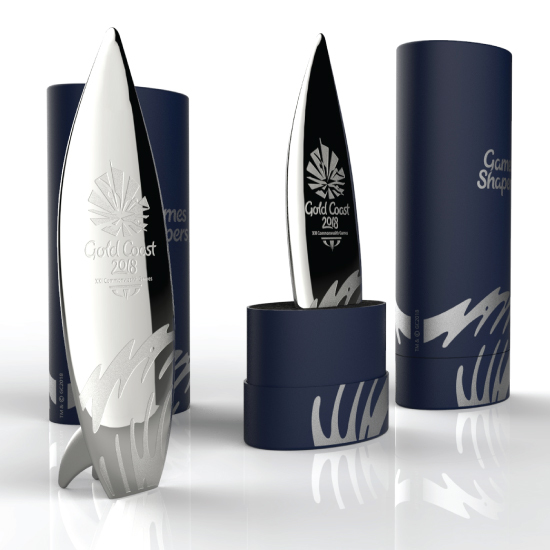 Whilst the action played our on Coolangatta Beach, we worked feverishly behind the scenes to create and deliver a unique collection of souvenirs for The Queen’s Baton Relay, GOLDOC, and the sponsor programme. Ever since the first London Olympics, global sporting events have been supported by armies of volunteers; Gold Coast recruited 18,000 “Games Shapers” to do just that. 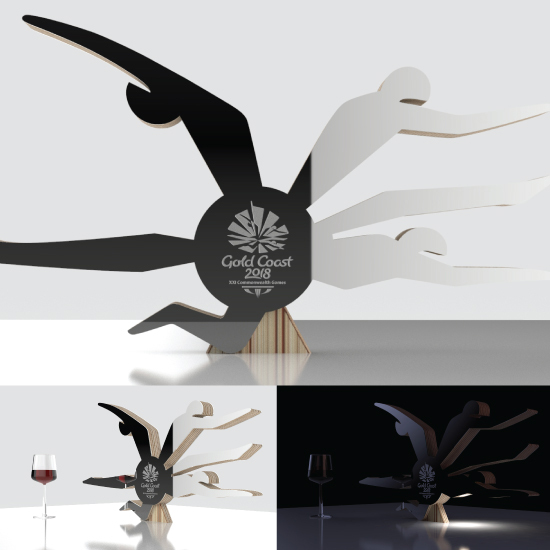 We were asked by GOLDOC to create a suitable recognition gift for the Games Shapers, it needed to be an object that captured the spirit of the event in Queensland. We considered a clam shell, a boomerang and even a flip-flop before settling on that icon of Australian surf culture, the surfboard. The surfboard goes back a bit. Before being adopted by beach boys in the 50s and 60s, the surfboard was a much coveted status symbol of ancient cultures; the longer the board the more potent the chieftain. For us, we loved that we could die cast the distinctive sleek shape finished in polished nickel plate and stand the piece upright balanced on a pair of supporting fins. The surfboard was presented to the volunteers in a smart oval shaped tube to protect and display the gift to best effect. 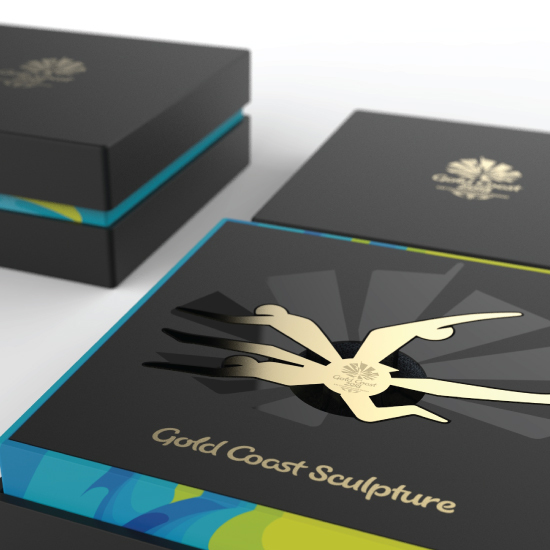 We delivered 18,000 units to Gold Coast, each one lasered with a unique serial number making it a stand out gift of Gold Coast 2018. In Glasgow 2014 we worked with QBR to create a souvenir baton in celebration of the Queen’s Baton Relay to be purchased only by the official batonbearers. Each baton was personalised with the name, segment and date of each participant. 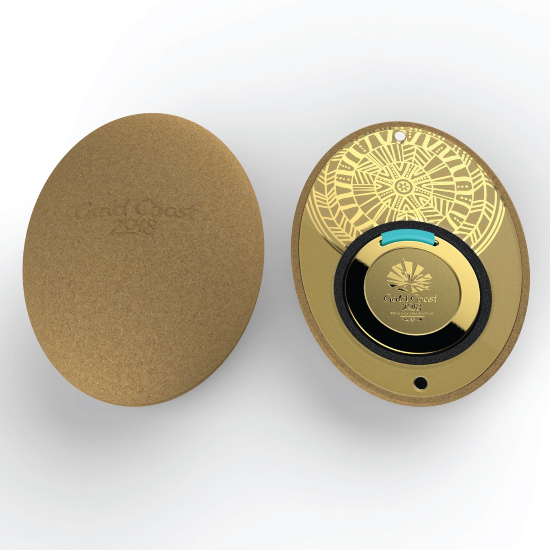 We were invited to work alongside QBR once more to deliver a unique souvenir for Gold Coast. Looking like a cross between a boomerang and a giant hair clip, the original baton travelled from Buckingham Palace 230,000 miles through the Commonwealth before crossing Australia carried by 3,800 batonbearers. Batonbearers are nominated by their peers for services to their communities so it is carried with immense pride. It was a logistical challenge for us to deliver batons to batonbearers across this vast continent. 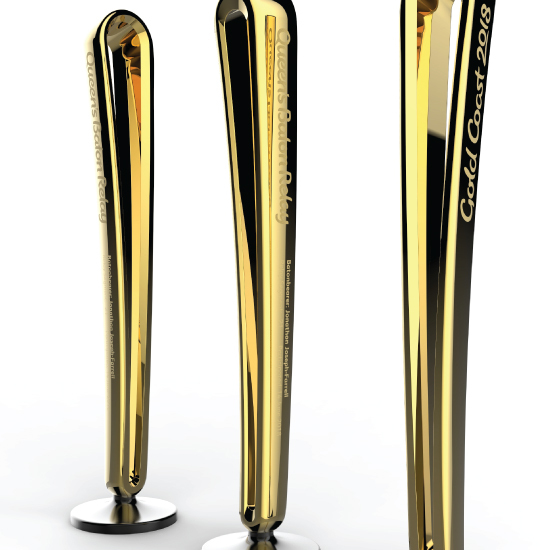 Although the Queen’s Baton is in fact mainly white, QBR chose a polished gold finish for the souvenir. The chunky 200mm high metal baton stands upright on a round base and features laser engraved markings. A specially designed black foam lined tube was created to ensure the baton would arrive in pristine condition. We produced and delivered nearly 2,000 personalised batons purchased online from a specially created secure website hosted and managed by us in co-operation with GOLDOC. Without sponsors to support and fund these hugely costly global multi sports events they simply could not be staged. We worked with the sponsor services programme to develop ideas for suitable gifting opportunities. Despite our geographic separation, we were able to reach out and connect with the team and deliver valuable and relevant merchandise. In the run up to the Games and throughout the sporting action, functions were hosted to celebrate sponsor involvement in Gold Coast. GOLDOC asked if we could come up with a stylish and glamorous table centrepiece fit for a banquet. We created an attractive table sculpture from aluminium that rotated on a turntable to sparkle and catch the eye. After the events the sculptures were auctioned to raise funds. Pins are hugely popular merchandise for celebrating all sorts of major events. We created a special collection for Gold Coast, exclusive to the sponsor programme and featuring elegant and iconic design elements. 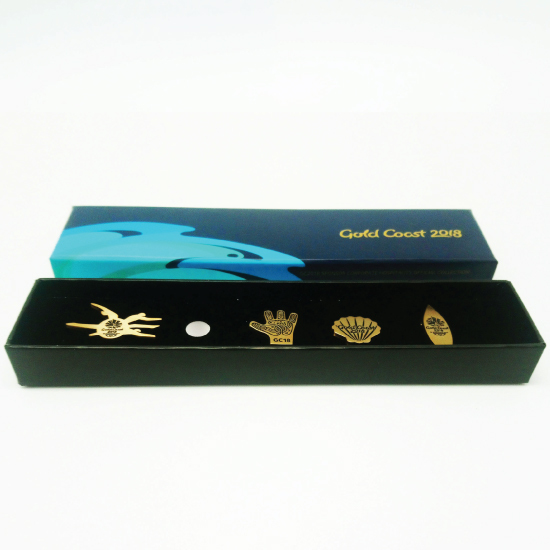 The satin gold pins were presented in a stylish full colour box set featuring the distinctive wave motif taken from the Games look and feel. Not every idea we come up with floats and there are many reasons why this happens; sometimes it’s a commercial matter, sometimes financial and maybe someone simply comes up with a better idea – shock horror! 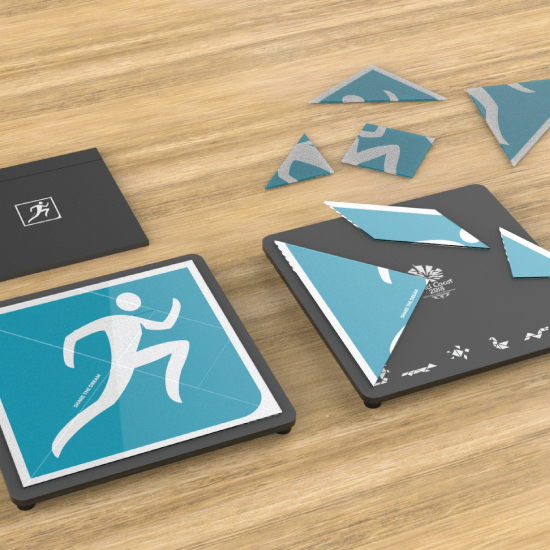 We were particularly disappointed when our design for the official medal case failed to go forward. We understood on this occasion it was politically important that a local Australian design solution should be adopted. 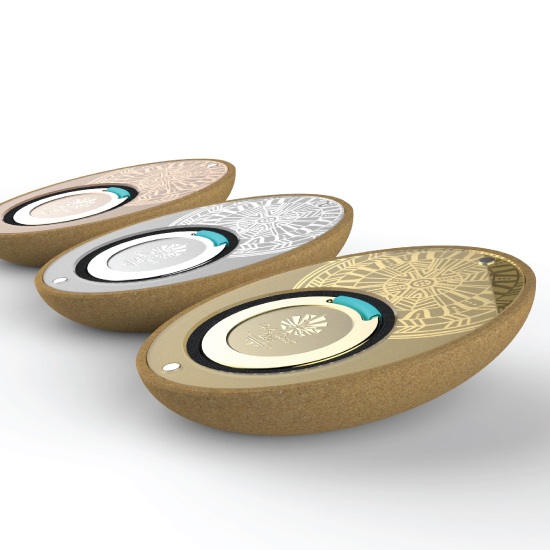 Our concept was for an innovative pebble-shaped casket formed of sand, an abundant and inexpensive material which is highly relevant to Gold Coast. We researched the possibility of a 3D printed sand resin case working in partnership with the World Foundry Organisation. Samples were produced and we proposed to print the cases in Queensland local to the Games. The result was a stunningly smooth sand pebble made in two halves that snap together using rare earth magnets. We hope to exploit this technology in future collaborations. 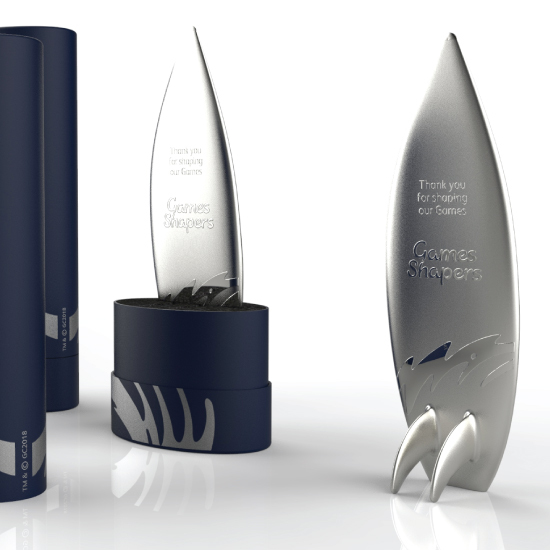 We will often propose a range of ideas for special high value gifting; this sculpture was an alternative design proposition for the Games Shapers gift. The design featured a unique interpretation of the Gold Coast 2018 emblem which we created specially for this project with permission from GOLDOC. 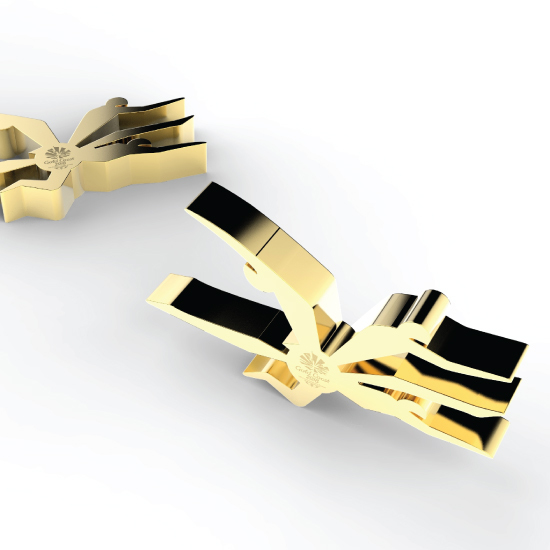 We extracted design elements of the logo and extruded the motif in gold plated aluminium to create a unique keepsake. Gift wrapping has a significant impact on the success of any gift. We proposed to present the sculpture in this stylish foam lined box featuring a full colour printed shoulder detail. A gloss lacquer printed card completed the emblem. Corporate functions can be rather dry events. To make things fun, we proposed a magnetic game that could be enjoyed by delegates working in teams around the tables. The Tangram is an ancient oriental puzzle consisting of 7 specially shaped “Tans” that can be reformed to create numerous animal figures. We suggested these could be 6 indigenous Australian animals that delegates could build during the evening. The idea was loved by the team but was not adopted due to budget issues.